Slot 21 Video Slot Review - Casino Answers! Slot 21 is a 5-reel, 21-line video slot developed by Slotland Entertainment, featuring a wild symbol, a gamble feature, a bonus game and a progressive jackpot. You can play the Slot 21 video slot at Win A Day Casino. Slot 21 is a penny slot. Bets on the Slot 21 slot machine are $0.01, $0.02, $0.05, $0.10, $0.25, $0.50, $1, $2, $3 and $4 per line. You can select from 1-21 paylines on the Slot 21 online slot game. To select your bet, use “Bet Up” and “Bet Down.” To select your paylines, use the “Line Up” and “Line Down” buttons. You can bet up to the maximum total bet of $84 per spin. The Slot 21 casino game has a good betting range for most online slots players. To play Slot 21, select your bet and hit the “Spin/Card” button to spin the reels. 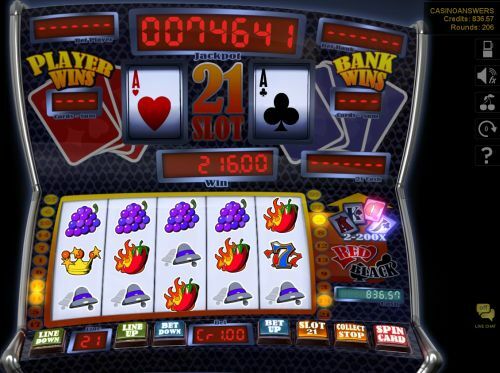 The Slot 21 fruit machine is linked to the Win A Day Casino Progressive Jackpot. At press time, this jackpot is at $74,678. If you hit 5 Crown symbols when making a total bet of $5 or more, you will win the progressive jackpot. If you are making a bet of under $5 on a spin and you land 5 Crown symbols, you will instead win the 1000X top fixed payout. The Joker symbol is wild on the Slot 21 video slot and can substitute for any other symbol on a payline. The Joker wild symbol will not substitute for the Red & Black symbol. The wild symbol cannot pay out by itself. 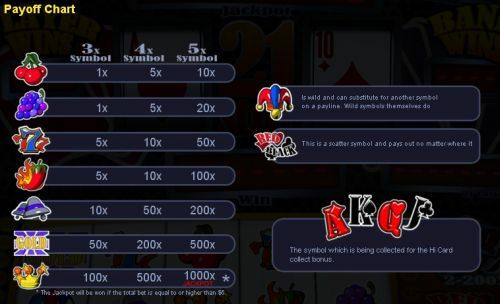 During the slot game, high card symbols (Ace, King, Queen and Jack) symbols will appear on the reels. Once you have collected all four, a special win of 2-200X your total bet will be credited to your balance. If your balance is $1 or more, you will have the option to play the 21 bonus game by pressing the “Slot/21” button. The idea of the game is the same as Blackjack, which you should be familiar with if you are playing this slot game. You need to a total card value of 21 without going over. Use the “Bet Up” and “Bet Down” to select your wager. To “Hit,” press the “Spin/Card” button. To “Stand,” press “Stop/Collect.” If you win the hand of Blackjack, your wager will be doubled. You can continue playing the Slot 21 game as long as you have $1 or more in your balance. Play Slots and Blackjack at the same time on Slot 21 at Win A Day Casino! The Slot 21 video slot has a basic autoplay mode that you can use to play many spins with minimal effort. Click the arrow symbol near the top right part of the screen to open up the autoplay mode options. You will be able to select 5, 10, 25, 50 or 100 autoplay spins. You can speed up the gameplay by skipping animations on winning combinations. Triggering any feature will bring the autoplay mode to a halt. You can stop Slot 21 autoplay mode at any time by pressing the autoplay mode button. Slot 21 does a wonderful job of integrating Blackjack into a video slot machine – the two most popular casino games around. If you’re a real casino player, you will love playing this video slot over at Win A Day Casino! Are USA players allowed to play the Slot 21 online slot for real money? American players are certainly able to play the Slot 21 blackjack slot game over at Win A Day Casino for free or for real money. Do I need to download any casino software to play the Slot 21 fruit machine? No, no casino software is required to play Slot 21. Simply sign up at Win A Day Casino and play! If you have any issues with the flash casino, we recommend updating your version of Adobe Flash Player.